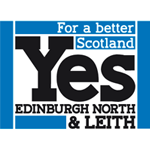 Welcome to the Yes Edinburgh North & Leith (YENL) website. YENL was set up to campaign for a Yes vote in the 2014 Independence Referendum. Since then, we have continued to campaign on a platform that all tiers of government should strive to make Scotland a better place for all of its citizens to live in. For example, we submitted proposals to the Smith Commission in good faith. However, the pace of political change in the UK and EU in recent months has put the constitutional question right back front and centre of the debate, and It has also become increasingly obvious that certain tiers of government are working to a different agenda. In this new political situation, YENL is encouraging people in Edinburgh North and Leith to JOIN US in a reinvigorated grassroots campaign for independence. We are not affiliated to any political party. We do not have a blueprint to which all potential supporters must adhere or a timetable for independence. We are an open organisation and welcome input from anybody who supports our aims.